French composer Hector Berlioz died 150 years ago. He has been a lifelong favorite of the British author David Cairns, who wrote Berlioz's biography and edited and translated his memoirs. Fans of Hector Berlioz — and record companies, it appears — need no excuse to celebrate the music of the pioneering French composer and quick-witted music critic. The sesquicentennial of Berlioz's death falls on March 8, and to mark the occasion, Warner Classics has released a 27-CD box containing, purportedly, every forward-thinking note the composer ever wrote. The byline of the album notes belongs to none other than David Cairns, the Yoda of all things Berlioz. He's the author of a 1500-page, two-volume biography of the composer and the translator and editor of The Memoirs of Hector Berlioz, one of the wittiest and erudite autobiographies imaginable. Speaking from his home in London, Cairns, now a sharp 92-year-old, talked at length about Berlioz's life and times, misunderstanding the composer's music at first, and why he thinks we need free spirits like Berlioz to keep our minds open. Tom Huizenga: How did you first come to Berlioz? David Cairns: My musical upbringing was extremely Germanic and I didn't discover Berlioz until I was over 30. For me it was Bach and then Beethoven and Brahms and Mozart and Wagner. I remember in the early '50s — it must have been the first long-playing recording of Berlioz's Symphonie fantastique, I think was by [Eduard] van Beinum and the Concertgebouw Orchestra — my sister said, "You must listen to this." And I listened to it and it was complete gibberish to me. It's extraordinary because she said that when she first heard some Berlioz, it was like being in a foreign country and suddenly hearing your own language spoken. What exactly did that "gibberish" sound like to you? I just couldn't put one bar together, one measure together with another. It didn't seem to make sense. The music fell on deaf ears as far as I was concerned. One of the things against Berlioz was that, although he was passionately addicted to Beethoven's music, he realized that he [would have] to write a different sort of music. His compositional procedures were quite different: They were based much more on long melodies, not short motifs. That was one reason why I, who was steeped in the Austro-German music, couldn't understand it. 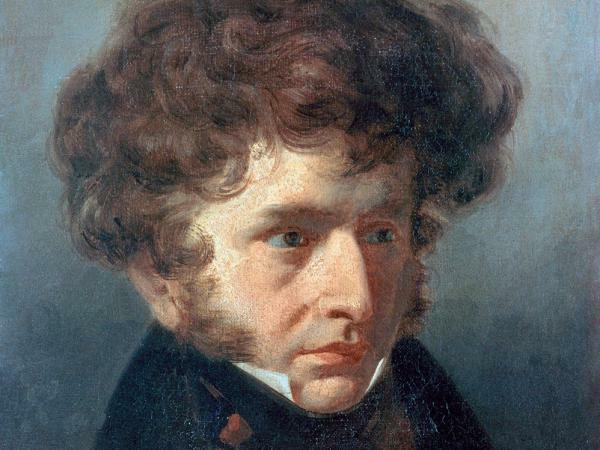 How would you explain Berlioz's music to someone who has never heard of him? I would say you just have to get to know it. Particularly with his very long melodic lines. You see, if a composer writes very short motifs, just a few bars, it's much easier to follow. But if someone writes a melody of 40 bars or something, you've got to get to know it. When it begins you don't know where it's going, and at first you may think, "Why is it going where it does?" With a lot of composers, say with Verdi — and I'm not saying anything against him — but his operas are not so different from each other. Berlioz had this extraordinary vivid, poetic imagination, and he would have a picture of a sort of world. Each major composition of his is a different, new world with its own rules, its own forms, its own colors. The first one I got to know well was The Damnation of Faust, and after that it took me quite a time to get to know something as completely different as the Symphonie fantastique or Harold in Italy or Romeo and Juliet. Each one is a new world, and you have to tackle it. Berlioz was not well understood during his life, especially in Paris where he spent most of his time. What was "wrong" with his music? Art is a much more sort of central business in France than it is in Britain, where a lot of people just don't give a damn if they don't understand it. Particularly in Paris, everybody feels they've got to have an opinion about art. Also, I think French writers on music were much more prone just to lay down the law. Even if they didn't know what they were talking about, they would repeat what other people said. So once this idea of Berlioz as an eccentric, who didn't write the "right" sort of music, took root, it was very difficult to dislodge. 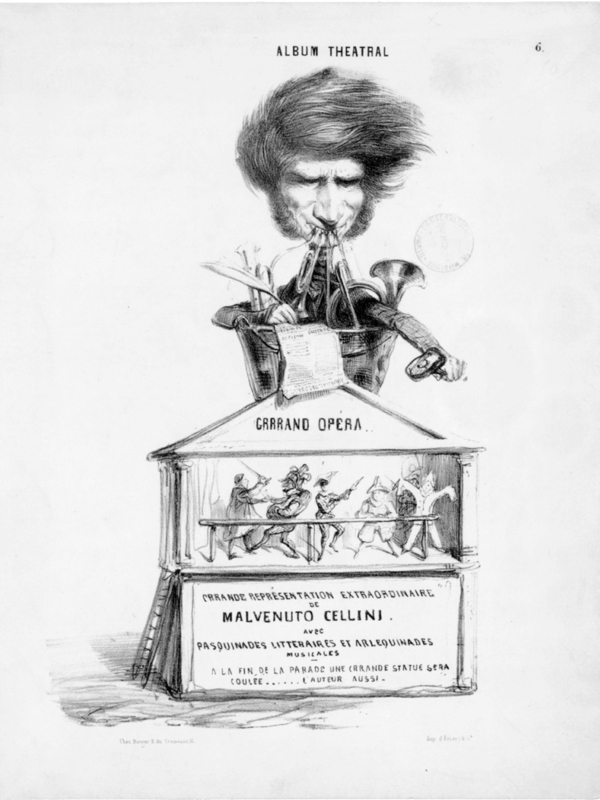 An 1838 caricature of Berlioz, following the failure of his opera Benvenuto Cellini at its premiere. His music does have a reputation for being difficult to perform. Yes, because it's rhythmically on a knife edge often — particularly his opera Benvenuto Cellini, where everything moves so fast, and where he's constantly switching the timbres of the big instrumental colors. I remember a friend of mine, who was a violinist with the London Symphony Orchestra, said, "You know, it happens so fast, and if you're just this split second late, you're lost." But I suppose orchestral technique is getting better all the time so that people can play this stuff, and they enjoy playing it because it's so varied and he uses the colors of the orchestra so brilliantly. In 1874, five years after the composer died, a critic in a Boston paper said, "Berlioz will be utterly unknown 100 years hence to everybody except the encyclopedists." Well, that's great. I'm sorry [that critic is] not around to have that opinion thrust in his face. Do you think Berlioz is less misunderstood today? I think that's coming to an end. Particularly in France, the 150th anniversary of Berlioz's death in Paris is being celebrated on a really grand scale at the moment. ... In music, I think it takes a very long time to eradicate false ideas about composers. [But] there's no reason why things shouldn't change eventually. The conductor Colin Davis once told me he thought of Berlioz as the "first genuine romantic, maybe the only genuine romantic." He seemed to be this passionate idealist who made up the rules as he went along. He made up the rules, but not as he went along. He had very clear plans. As a student at the Paris Conservatory, he was always being told by the professors that you can't write anything new — the great masters have done it. And he thought, that's nonsense, of course I can write something new — I'll just go my own way. He rejected the "rules," but that didn't mean each composition shouldn't have rules. The rules should be made for each particular work. But I also agree with what the conductor Roger Norrington said, that Berlioz writes romantic music with a classical sound. The fact that he never learned to play the piano has a terrific influence on the way his music is laid out, and the clarity of it, and so on. I think that the sustaining pedal of the piano had such an effect on the way people wrote music in Germany, particularly in the 19th century. And Berlioz, who never learned the piano, escaped that. Berlioz was also a very clever writer of words and observer of human nature, including religion. At the beginning of his memoirs, when he's talking about being a member of the Catholic Church, he writes: "This charming religion (so attractive since it gave up burning people) was for seven whole years the joy of my life." Does that strong personality and wit ever surface in his music? Yes, it does. I think that although he turned against God — in his memoirs he says God, in his indifference to human suffering, is just stupid and revolting or something like that — he remembered what it was like to be a fervent believer. And that sort of regret for the loss of that belief is one of the things that fuels his religious music. After all, it's interesting that three of his main works — the Requiem, the Te Deum and The Childhood of Christ — are religious works. And I don't think that's accidental: They were things he wanted to write. That was because somehow the lost faith was painful to him. He's trying to recapture the feeling of humanity down the ages and the desire to believe in God, even if there isn't one. What about the wit? Does that show up anywhere? I think The Damnation of Faust is a witty work. The way he treats the drunken revelers in Auerbach's cellar and the parody he writes, the "Amen" fugue. And Mephistopheles, with all his brutality and evil, is also quite a witty person. Also Benvenuto Cellini, the opera, which is beginning to be performed much more often now, certainly in Europe, is beginning to come into its own. That is a very witty score. Berlioz often mocked the music scene in Paris, both as a professional critic and as a public figure. He said things like: "Art in France is dead," or "In Paris music too often speaks to morons, barbarians and the deaf." What were his main complaints about the Parisian music scene? I suppose it was partly the fact that so much mediocre music was performed. Also, they didn't rehearse properly. He describes — I can't remember which of his books it's in — what happens when a new opera is produced at the Paris Opera: People just lounge around and don't really take it seriously. It's a very long rehearsal period, and probably for that reason, people didn't work hard enough. But again, I remember Verdi saying that when you arrive at the door of the Paris Opera with a new score, within 10 minutes even the doorman knows that it's no good. They were very arrogant. I think also, a lot of money was spent on cheap music. And one of the things that Berlioz wanted to do as a music critic was to raise the taste, and in fact make people understand that Beethoven was not a bore and not some mad foreigner. He didn't like having to spend so much time as a music critic — because that's how he earned his living — and not composing music. How was Berlioz received in Paris as a music critic? His pen could be pretty sharp. Contemporaries of his complain about the bitterness and savagery of his criticism. But Berlioz is rather like Bernard Shaw in that respect, in that he uses a rapier as a weapon and not a cosh. He is very delicate, and he uses humor. Sometimes, if he doesn't want to say how awful an opera is, he spends all his long notice writing about the libretto and what happens, and sort of passes over the music. It's very difficult to generalize about a place like Paris, because there are some people who think something's awful and a lot of people that think it's good. That was the case with Berlioz: He had a big readership because the paper he wrote for, Le Journal des débats, was one of the chief dailies. But his criticisms were treated with respect. Just because he was so trenchant in his opinions, people thought he was brutal, but he wasn't. The things people wrote about Balzac novels, for instance, would make your hair stand on end. You translated and edited his memoirs, which have to be among the wittiest memoirs of any musician. Do you have a favorite Berlioz story that means a lot to you? Of course some of them are particularly grim, like the one where he disinters his first wife's body. But I'm very fond of the chapter where he talks about going to the opera: how he is weeping at some passage in one of those early French classical operas, and then suddenly a man from behind, who's noticed this, lifts him up and sits him down next to him, and they become very friendly. I also love that scene in Budapest when he's conducting the Rákóczy March and a Hungarian rushes into the green room afterwards and embraces him. For Berlioz fans, any time is a good time to celebrate him, but now we're at the 150th anniversary of his death – why should we care about him today? I think because he was such an intelligent man. And also, so many of his contemporaries suffered from this idiotic blight of anti-Semitism, and he wasn't like that. I've worked on Berlioz ever since the late '50s, and I find I never get tired of him: His wit, his humor, the breadth of his mind are so extraordinary. He was a great reader and he was a true European. And that's very important is the age of Brexit. Debussy described himself as a "musicien français." I don't think Berlioz could have ever said anything like that. He said he had the misfortune to be born in France, but he had a passion for the whole world. He had a very open mind and that's something. I'm not saying anything against Bach – whose music I love – but Bach was a mass of prejudices about this, that and the other. Berlioz is a free spirit. It's one of the reasons why we should value him, quite apart from what music he wrote.